These pictures are from Jos Lambert. His boat was bought as an M.G. design, 31ft in steel. Modified with twin keels? Built in Nottingham he believes, it is junk rigged and he has sailed it as far as Lanzarotte. It sails OK but lacks directional stability. I think it looks like a WW or possibly stretched Eventide, I did hear of one with twin keels. The Rudder and skeg do not give a lot of clues, but the hull shape looks very much Eventide. 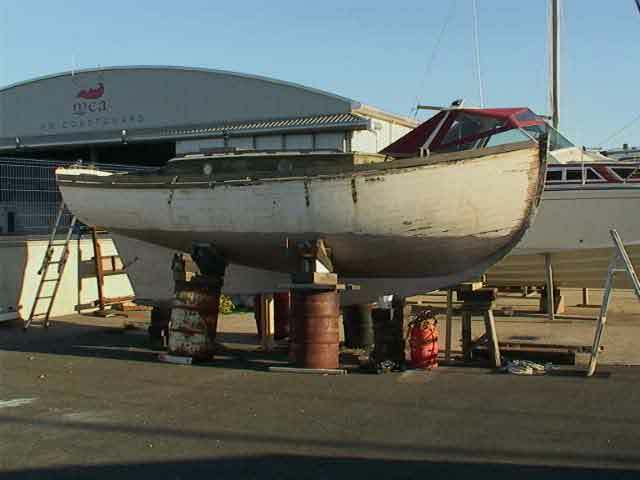 The raised topsides may not look all that pretty, but this boat has some miles under it's (twin) keels! Junk rigged and open water sailing! Can we help Jos? If you know more about her origins or can identify her parentage, contact me and I will put Jos in touch with you. 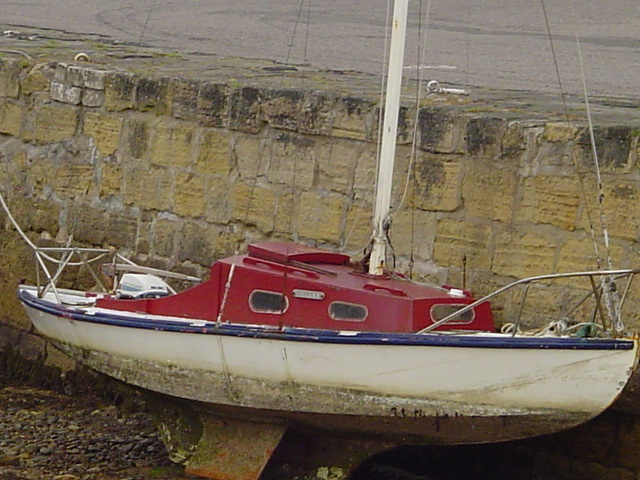 This boat is moored at Burnham, 'Camille'. Is she one of ours? Stefan thinks she looks like a 3 Tonner, but the 3 tonner is only 19ft long, this is over 25? These three pictures have been sent in by Simon Grey. They are of his boat 'Free Trader', that he believes may be a MG design. built in Whitstable in 1947 by Perkins and Smith. Beam 8'10" Draft 4' 6" 30ft on deck. She is built of pitch pine on oak, the coach roof has mahogany sides, floors are mild steel. 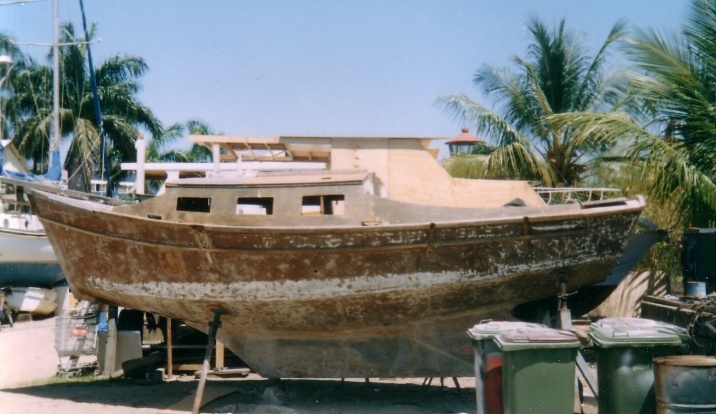 She has a long keel and large rudder, hull shape very like the 'Bawley'. The foredeck hatch is new it used to be on the coach roof to stbd of the mast. The doghouse has been replaces, although it is similar to the original. The splendid pics are by Kathy Mansfield, a professional of course! Taken on Loch Ness. Simon Bishop has sent this one in. He owns her. It is 35ft long, or is it,?? if it were 38ft, could it be a Barrier Reef, it is Ferro and looks very much like one I have seen... 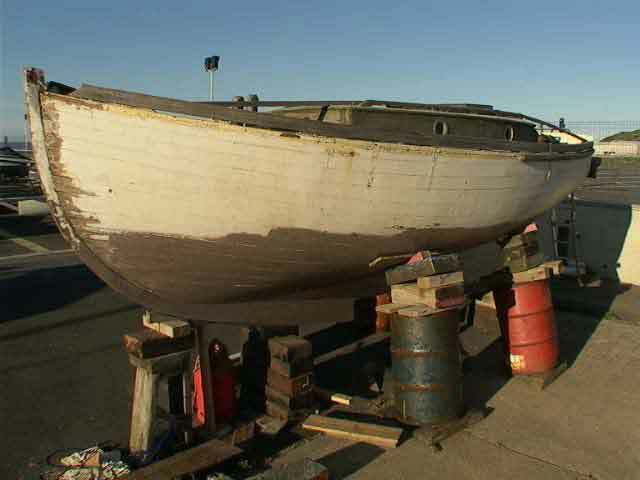 This one is named 'WestWater' and built by Harvey's of Walton on Naze? Any one throw any light on it. Simon has been back to me with some more measurements. It is 31 ft long with a beam of about 10ft. draft 4' 9", that leads me to believe she is the Ferro version of the Tidewater, a 'Blue Water' We have moved all the rest of the pics to the MG page now! 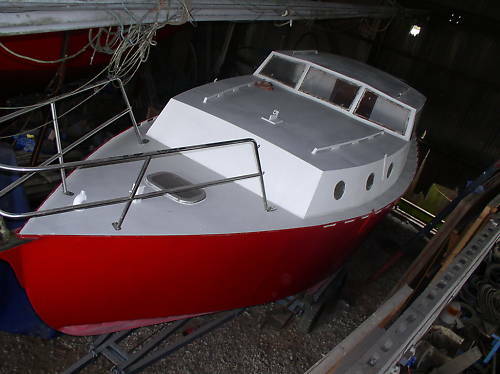 These pics of 'Lady Anne of Melbourne' have been sent in by the owner Dennis Chapman. he has bought her as an M.G. design? 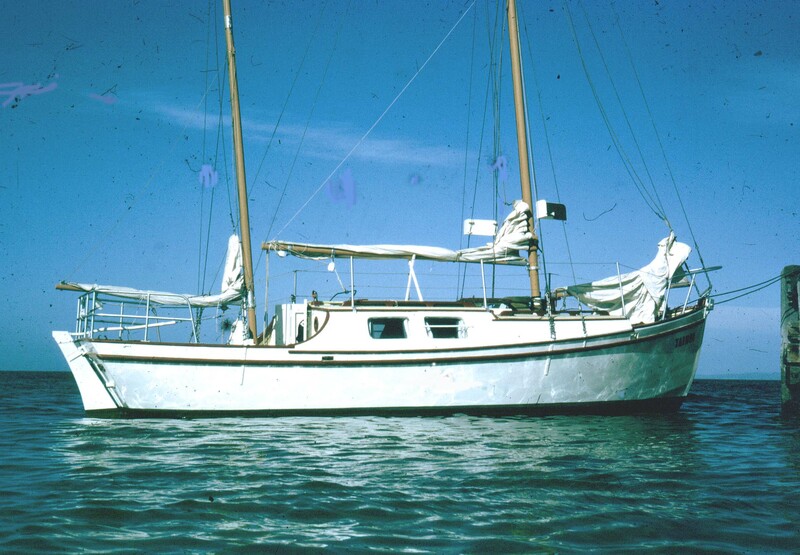 built in Melbourne Australia in 1978, rigged as a Gaff Ketch I am not sure. He thought it looked like a Rowland designed Mouette, but it is not, they were flat bottomed. the hull has sort of the right look for an Eventide, but the stem is different, I won't say wrong! Dennis has given me the dimensions. 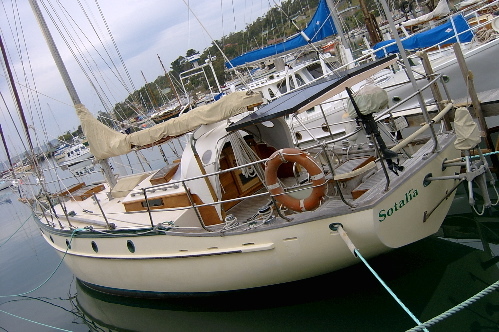 on deck, 24ft. beam, 8' 3", draft 3' 6". pretty much spot on for a fin keel Eventide. She has a 4' 6" bowsprit. What do you think? Can you identify this grand old lady? 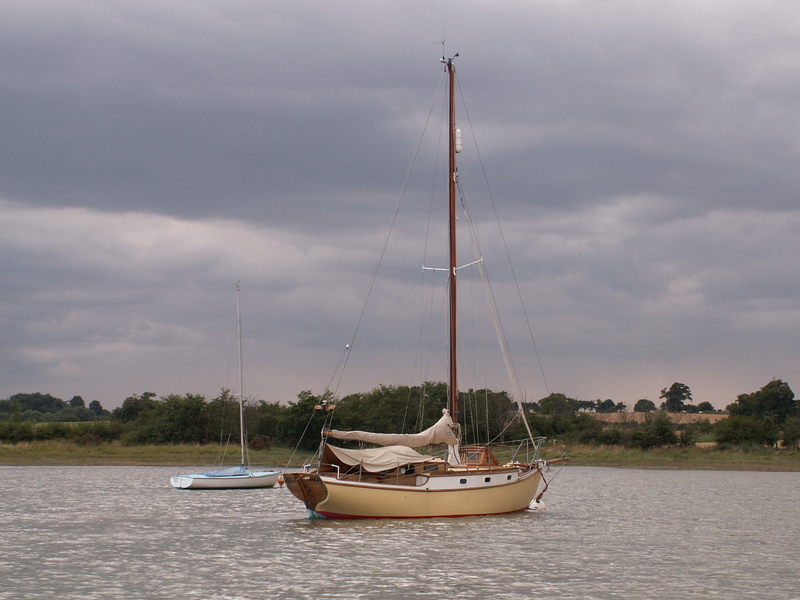 Ian Clarke has sent this in, 'Peterwit' is a local boat to me, over at West Mersea. Is she may be a 'Peter Duck' class, or an M.G. , who did design her.?? Certainly a nice looking vessel. 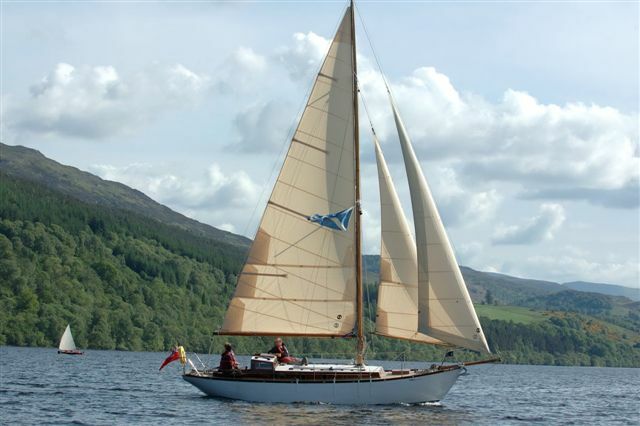 Information from Adrian, She is a Kylix Class boat, and has just sold to new owners 2006. Moved to the MG designs page! Another from Ian, this one at Woodbridge. Is she an M.G. She looks as if she might be a 'Rossiter' maybe a 'Pintail'? Anyone know? Thanks to Steve Richards for confirming my thoughts, she is indeed a 'Pintail'. He knows them well, as he lives near their yard at Christchurch. 'Tainui' This boat is in Australia. It is thought she is a MG design. We have just learnt that she has a beam of 10ft? Too wide for a WW, or do you know of one that was built with that beam? 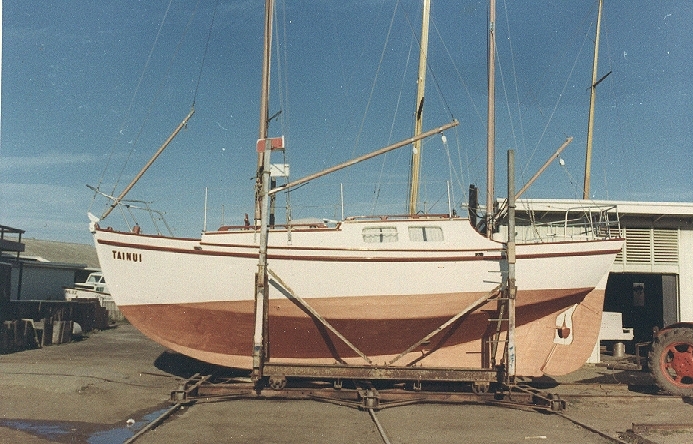 A 15 foot clinker built sailing boat, gunter rigged (Larch on Oak) built by Johnson & Jago pre 1982. I am trying to find a little more of her history do you know who could help? We believe this might be a Vulcan class?? 'Con Pyrac' or similar is the name. 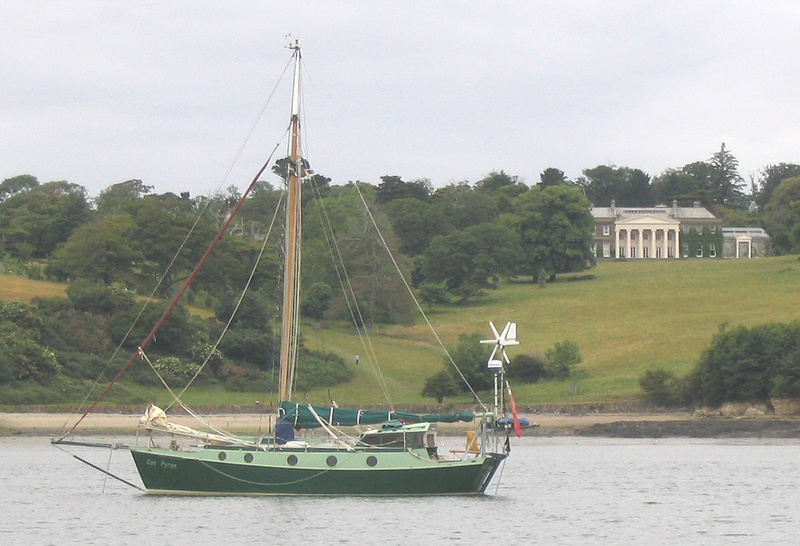 Snapped off Trelissick, Cornwall in about 2004 by Warren Stevenson. Anyone know anything about her? Like the colours! The boat pictured in your unidentified section and believed to be called Con Pirac is a Wylo II and is actually called Can Piran. 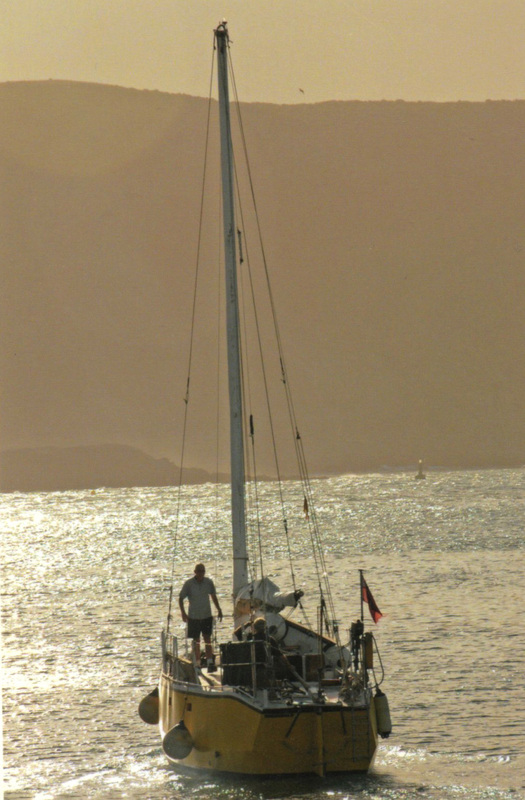 She was the subject of an article in Yachting Monthly some three or four years ago. They are built from steel to plans supplied by the designer Nick Skeats. A few were built here at Islington boatyard in Penryn, Cornwall. 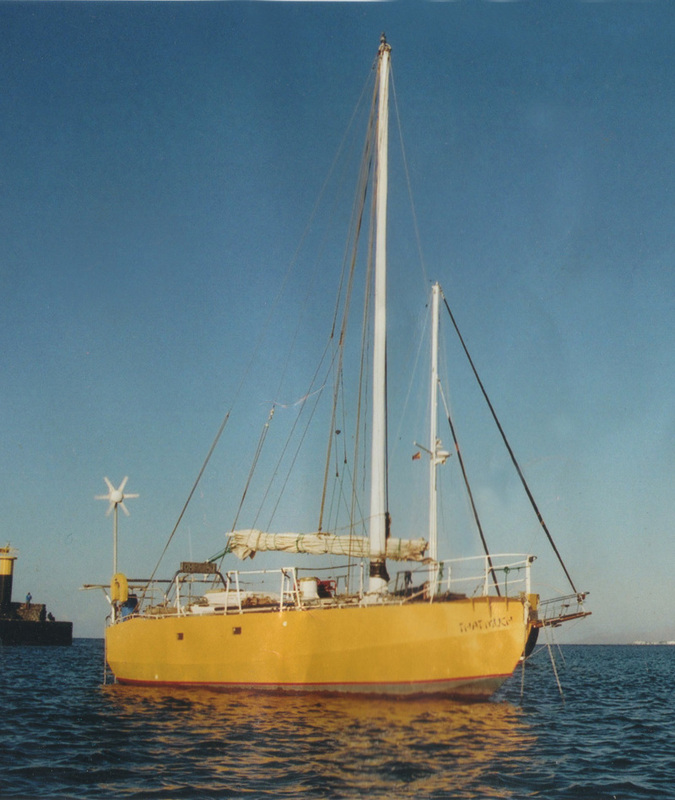 One was completed by her owner in the yard and launched last year. Mark Bury. Thanks Mark. Always amazed how many read these pages, we are indebted to you! I was down at Liverpool marina for a sail on a fellow members yacht (unfortunately not a MG design) when I spotted this vessel in the Marina her name is Miranda II. 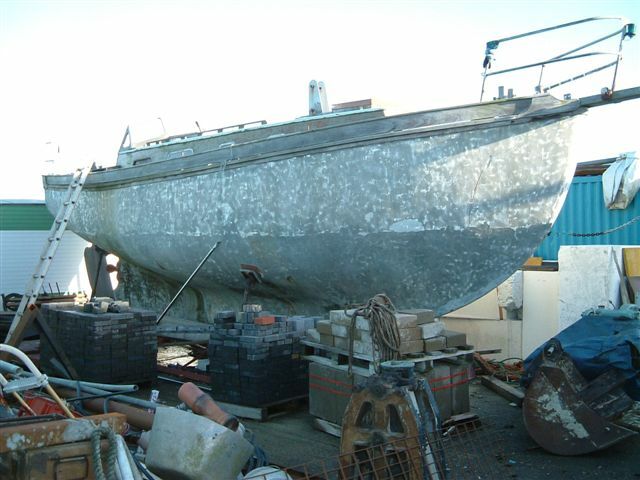 Her hull seems very like a Waterwitch to me, in which case it is the second one I have seen (My own Penny the first). Wonder if any other members know her or of her. I notice you have an unidentified section and would like to offer the pictures for your site. If anyone knows the owner and it is a Waterwitch there were two on the North Shore of the Mersey! 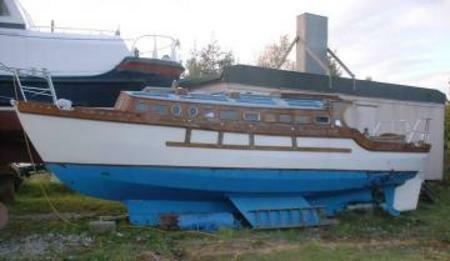 'That Much', The owner thinks it may be based on a Waterwitch, but more enquiries seem to suggest just 2 keels. The raised topsides and chine shape is sort of WW like, but again you have to stand a long way away and squint.